Update: 1040 driver files have been released (added to download section). These are from a newer build than both previous versions and should give better performance. I noticed there was much less stutter compared to 1036 and small fps increase in some scenes. If you have tried the 1036 and 1040 versions and notice any improvements, please let me know in the comments section, it will be very helpful to both me and other users - thanks! These files are taken from the latest Windows 10 AMD 1036 drivers (found at the Guru3D forums). They seem to offer significant performance increase even in DirectX 11 games, despite being built around DirectX 12. This means that games such as Witcher 3 can already benefit from these improvements! I have a single r9 290 and with these files I gain just over 5fps overall and even up to 10fps in some CPU-intensive areas. The performance improvements will likely be seen more on lower-end CPUs as these drivers allow the GPU to use more draw-calls, thus allowing the GPU and CPU to communicate better with each other! 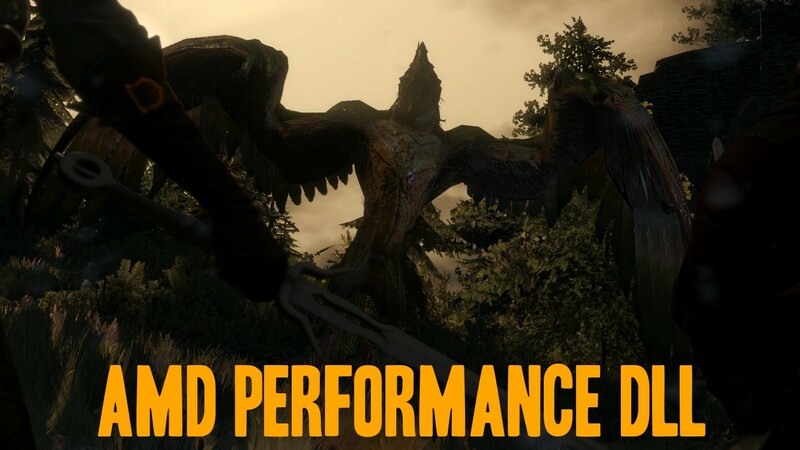 see if you gain any performance improvements. It may not work for every AMD card, I have only tested it on a couple of systems however they did all have relatively new hardware. order to work they must be in the same folder as "Witcher3.exe". Simply remove or delete the 4 .DLL files from the Witcher 3 directory. No FPS difference - I would only recommend to try this if you have a HD 7870 or higher (including all r9 series). You can try using it with a less powerful card, but the differences will likely be too small to notice. Game doesn't start - If your game refuses to start or crashes at startup, you should try updating your graphics drivers first; especially if it's been more than 2 months since you've updated them. If it still doesn't start then try using the 1023 version in optional downloads (If these work, try 1023.5 for slightly better performance). If neither files work for you, then unfortunately your card may be incompatible with these drivers. Resources and files were all found at Guru3D. Thanks to Guru PrMinisterGR for these files! All credit goes to him :) .